EVERYONE has a story! Are YOU READY for the WORLD to hear yours? You’ve thought about it! Talked about it! Dreamed about it! Now you can BE about it! You can be an AUTHOR! 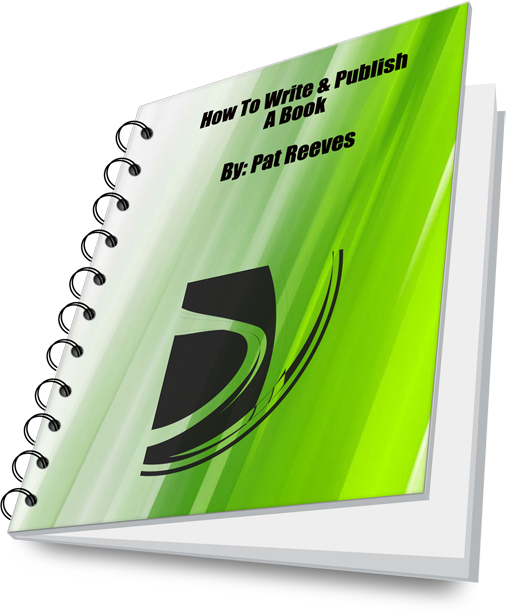 This ebook By: Pat Reeves on How To Write & Publish a Book is just what you need to make your dream a reality. You will learn the 8 steps to writing and publishing your book. How to copyright. How/where to market your book. What an ISBN number & Barcode is AND MORE!! ORDER NOW and receive (FREE BONUS INFORMATION) that will show you how to sell your book on a national level as an (eBook) at Amazon.com, Kindle, Barnes & Noble (Nook) and MORE!!! With just one touch of the green button you can have this manual right at your fingertips. Your dreams of being an Author can come true. YOU ARE ready for the WORLD!